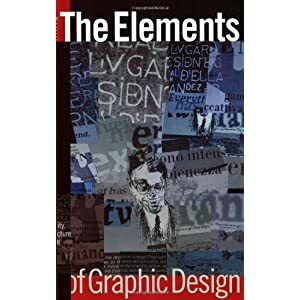 The Elements of Graphic Design by Alex White is a book that is about exactly what it sounds like. It discusses all the different things that go into graphic design and design in general, as well as the variety you have with all of these elements and how they work together. I chose this book because I didn’t want a book that discussed one aspect of design. It speaks of how graphic design issues have many answers and not just one, which to me, is a beautiful thing. No matter the discipline of the design field you’re in the book says “…each must respond to 3 questions: What are the elements I have to work with? Where do these elements go? What structure is necessary so they go together?” This made me realize design does not have to be complicated; I’ve been making it complicated for myself. I had always thought about the style more than design aspects and those three questions were eye openers. The elements highlighted are: space, unity, page architecture, and type. In each section for the elements it explains why each is essential and its importance, as well as how they can build off of one another. There are unlimited possibilities with how you can use any of these elements. The one thing I will take away from this book forever is a sentence from the intro, “Design is simple when you remember it is a process, not a result.” Overall this book was intriguing and I recommend it greatly if you struggle with over thinking design ideas.